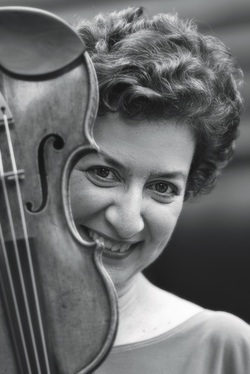 Barbara Govatos holds the Wilson H. and Barbara B. Taylor chair of the first violin section of the Philadelphia Orchestra and was given the C. Hartman Kuhn Award for enhancing the standards and the reputation of the Fabulous Philadelphians. She and pianist, Marcantonio Barone were presented with the Samuel Sanders Collaborative Artists award by the Classical Recording Foundation in recognition of their recording of the complete Beethoven Sonatas for violin and piano on Bridge Records. Ms. Govatos has collaborated with Emmanuel Ax, Radu Lupu, Riccardo Muti, Christopher Parkening, Wolfgang Sawallisch and the Emerson String Quartet. She made her debut in Alice Tully Hall with the Juilliard Orchestra and has made appearances with the Dallas and Delaware Symphonies, and the Chamber Orchestra of Philadelphia. In addition to performing worldwide with the Philadelphia Orchestra since 1982, Barbara has been heard at the Marlboro, Salzburg, Saratoga, Maggio Musicale Fiorentino, Marblehead, and Music at Gretna Festivals and has given recitals, chamber music concerts and master classes at UCLA, Mt. Holyoke College, University of Delaware, Bucknell University, Westminster Choir College of Rider University and Carnegie’s Weill Hall. Barbara is Music Director of the Delaware Chamber Music Festival, which celebrated its 30th anniversary in 2015, is a member of the Baroque ensemble, Amerita, champions the music of women composers, and is a frequent guest artist with Lenape Chamber Ensemble and on the Philadelphia Orchestra’s chamber music series. In addition to performing and teaching, she loves tennis, kayaking, traveling, theater, and her 14 year old son, Minh, but not in that order. Ms. Govatos earned Bachelor and Master of Music degrees from The Juilliard School as a scholarship student of Ivan Galamian. During that time, she won the G.B. Dealey International Competition, the Charles Petschek Scholarship, and the Austrian American Society’s scholarship for study at the Mozarteum in Salzburg. Her musical mentors included Sabina K. Girvan, Jascha Brodsky, Felix Galimir, Josef Gingold, Robert Mann and Mischa Schneider. Ms. Govatos serves on the Advisory Board of Astral Artists, an organization that promotes, presents and advises talented artists on the cusp of their musical careers, and the Music School of Delaware, a community music school, where she began her studies. ​See this blog post featuring Barbara.